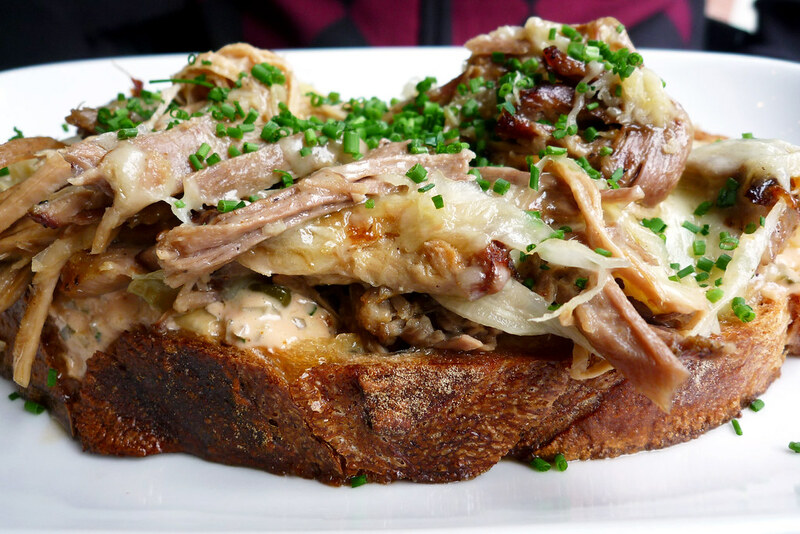 In this solo dining adventure, Gary takes another trip to the far west side of Manhattan to try the recently re-christened Colicchio & Sons. Top left – entryway. Top right – the bar. Bottom left – Shane McBride working at the giant open oven. Bottom right – tap room. Let’s travel back in time to 2006, shall we? It was a wonderful time where the Mets were running away with the National League East and the world was blissfully unaware of Justin Bieber (I’ll admit I still have no idea who the heck that guy is). Oh, and the economy hadn’t completely gone down the shitter yet. It was in those better times that Tom Colicchio, then more known as a New York chef than Top Chef judge, opened the latest entry in his growing Craft empire, Craftsteak. Back then, $100 steaks didn’t seem so unseemly (to some maybe; to me, always) and it enjoyed plenty of glowing reviews (two alone from Frank Bruni at the New York Times in his final three years as their food critic). Fast forward to 2009 and the economy is now an absolute mess with big government bailouts of banks and record unemployment numbers, with New York City feeling it acutely since they have the banks and plenty of the newly unemployed. It just doesn’t seem right dropping a c-note on a steak anymore, does it? By this time, Tom Colicchio had become better known as a television personality and, though he may not admit it, there must be some annoyance on his part that the perception of him no longer focuses on the chef part of his career. In 2008, he started Tom: Tuesday Dinner, a bi-weekly series of dinners that he would cook at Craft. It was a return to his roots and it was a successful one, prompting him to desire opening a restaurant based on that experience. Instead of opening a new one, he chose instead to simply swap out Craftsteak for Colicchio & Sons. Still, I wasn’t sold on eating there and my resolve was further strengthened when dinner switched to a $78 prix fixe meal. To be fair, this only applied to the dining room while the bar would remain à la carte but you don’t cite the economy as a reason to change tact and then impose a costly prix fixe on all your diners. What did get me through the door finally was the introduction of lunch (à la carte) in their tap room with the first week being a special prix fixe in which diners got to choose an appetizer, a sandwich/pizza/main, and a dessert for only $25. Considering the prices of the appetizers were in the $10 range and main courses ran up to $18, $25 for three courses looked to be a steal. With that in mind, my friend Dave G. and I showed up for a late lunch on a lazy Thursday afternoon. 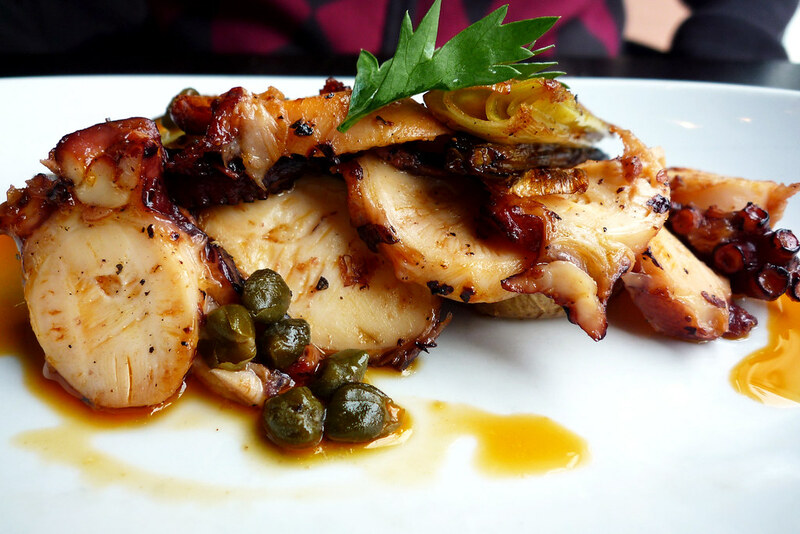 Warm Octopus and Potato Salad with Paprika & Capers. Dave started with the octopus and potato salad. The octopus was well prepared – cooked to the proper tenderness so that it was not overly chewy. Properly seasoned and with the addition of the capers, it had a good amount of flavor. 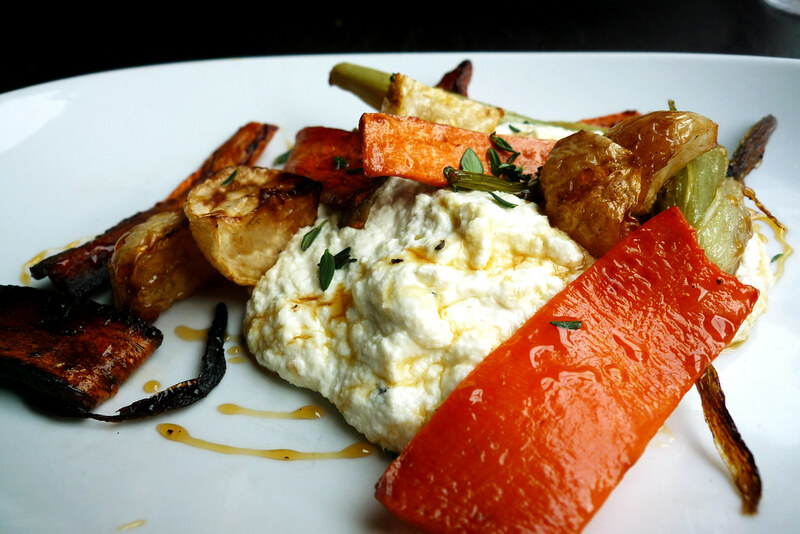 Fresh Ricotta with Roasted Root Vegetables & Truffle Honey. I ordered the ricotta and roasted root vegetables. The ricotta was creamy and with the drizzle of truffle honey over it made dipping the roasted vegetables a delight. The giant oven nearby turns out a large amount of vegetables – if it’s solely to keep up with the number of times this dish is ordered, it wouldn’t shock me. I practically scooped up every bit of the ricotta off my plate and if proper decorum didn’t dictate I not do so, I might have licked the plate. 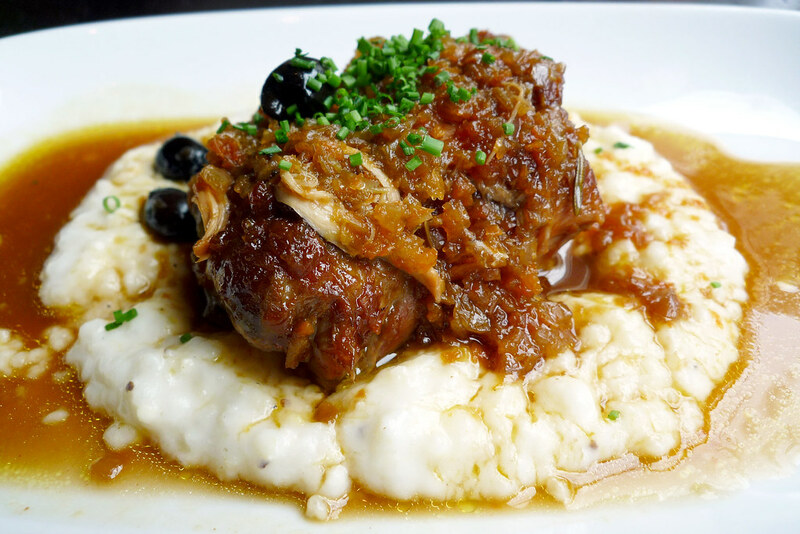 Braised Rabbit Legs with Grits & Soffrito. Many minutes after the appetizers were cleared from our table (more on that later in my final thoughts), our entrees arrived. I had the braised rabbit legs which were cooked to the right doneness and tenderness, helped along with a long braise. However, it lacked flavor which is funny considering one of Mr. Colicchio’s common gripes on Top Chef are the cheftestants’ lack of seasoning. I suppose the oft-heard comment from him – “[the cheftestant] forgot the salt” – would apply here. The soffrito was certainly tasty enough but no amount would mask the blandness of the meat. Points however go to the creamy grits which, along with the soffrito, made this a passable dish if not good. Dave, unfortunately, could not say the same for his entree, the suckling pig sandwich. As he describes, it “had a consistency of sheer gloppiness and just felt slimy to eat” thought he “did like the Russian Dressing and things slathered in melted cheese in general, if not the presentation or the bland pork.” His biggest gripe though was the presentation – “if you’re gonna serve it open faced, say so on the menu.” Two meat dishes, two disappointments. Zeppole with Lemon Curd & Vanilla Ice Cream. After waiting quite some time yet again for our desserts, time I spent apprehensively because if the mains could be so flawed, I didn’t know what to expect now, our zeppoles finally arrived. 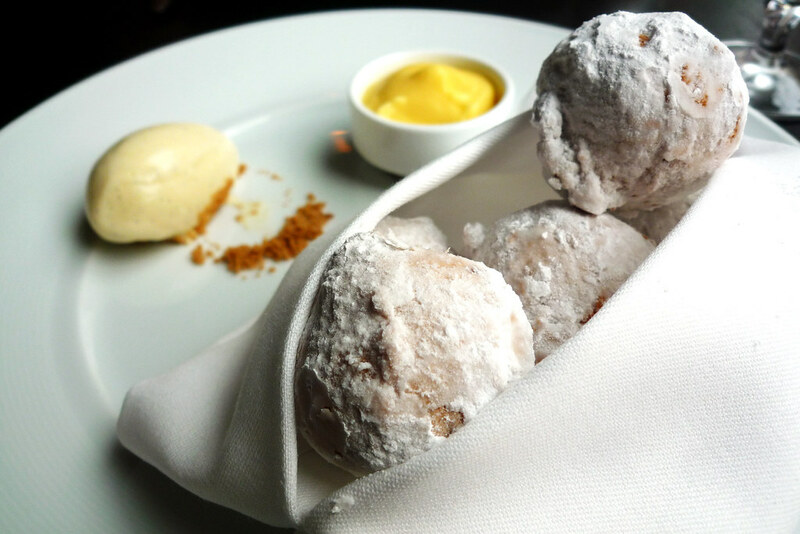 The presentation is beautiful as you can see from the photo above, five or six (can’t recall for sure) little balls of fried dough dusted with powdered sugar nestled inside a napkin nest with stunningly yellow lemon curd and vanilla ice cream. The zeppoles were perfect but it was the lemon curd that made this dish the best of the meal. For $25, this was a good meal. If I were paying à la carte, however, this would have been a major disappointment. The appetizers weren’t outrageously priced and were executed such that they earned it. The entrees were another matter entirely. For $18, I would expect rabbit legs to at least have some seasoning. Dave’s suckling pig sandwich “had no business being served at a 3 star restaurant.” When the dessert is the best part of the meal, something that the head chef doesn’t have much control over, that’s a concern. If I were to ever come back for lunch, I’d probably take a seat at the bar, have an app or two, some beer, and just avoid the mains. Now the service – the servers were professional and took care of us. I have to say that the hostess totally came through for me when I told her my phone’s battery had died and she immediately went through her pouch of chargers until she found one I could use to recharge it. My good graces were nearly obliterated by the time Dave and I spent waiting for each dish. It was a good 20+ minutes between when our appetizers were cleared and our entrees were served. Again, I hate to bring up Top Chef since they only show us what they’ve edited the footage down to but Chef Colicchio also likes to gripe during the show’s Restaurant Wars challenges about the amount of time between courses. It wasn’t as though the room was packed when we were eating either. Dave summed it up best – “it seemed like he’s obviously going for the highbrow/lowbrow DBGB vibe, but DBGB is more fun, and with a better beer selection.” I really can’t describe this place any better. 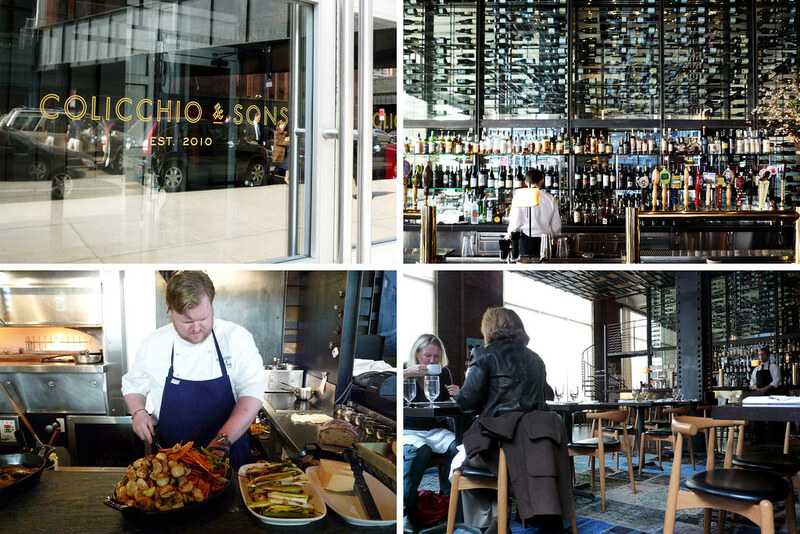 Colicchio & Sons. 85 10th Avenue, New York, NY 10011. [Show/Hide Map] (212) 400-6699.
much more time/energy/money is spent on decor & ambiance — more bang for the buck I guess. Well Gary, thanks once more for allowing me to dine vicariously through you (& Kate). See ya.